Friday 26 Apr - Check the listings below for the latest online stock. Stock of Imaginext Mega T-Rex is currently in very short supply. Our servers are constantly tracking retailer websites for stock ensuring you are the first to know when T-Rex stock is found. We can also send you email alerts by registering your details. During periods of stock shortages stock can sell out very quickly (sometimes in literally minutes), we therefore provide you an accurate up to the minute stock analysis of UK retailers. Loud audible alerts are available via our unique Mega T-Rex Stock Alert webpage. Our servers are constantly checking for Mega T-Rex stock, so you don't have to. 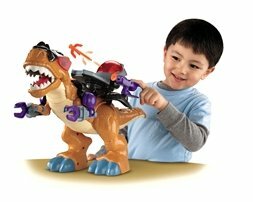 The Fisher-Price Imaginext Mega Tyrannosaurus Rex takes classic dinosaur play to the next level. This T-Rex has a motorised action, removable armour and roaring sound effects. Press the button on the T-Rex back and he will swing his neck and arms, open his jaw and roar like only a T-Tex can! Also gear up the T-Rex in his tech armour ready for battle with a figure control station, tech arms and two projectile launchers that actually fire! Open the pod door with the activation disc on his back and extend the T-Rex capability with his extended tech arms which have large mechanical claws. 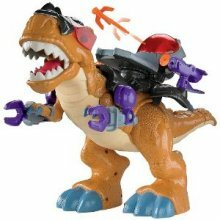 The Imaginext Mega T-Tex has great detail and motorized action ensuring realistic dinosaur play. Suitable for ages 3 to 8. Requires 4 x AA Batteries (Included). Assembly required. Quick Register and receive Free Email Alerts when online stock is found. Use this application to automatically alert you with either a loud audio alert or silent pop up box when new stock is found. Just leave the webpage open and it auto refreshes itself every minute. Are we not tracking a product you can't find in stock anywhere? Please suggest a product to track and we'll take a look. Alternatively, why not try creating your own Custom Stock Checker. Registration required.